This band is extremely versatile. They are like 3 bands in one. 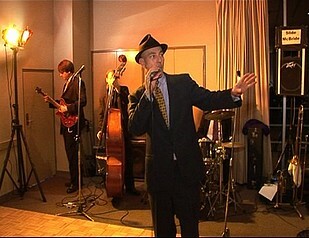 They can play cool crooning jazz, latin, swing and lounge music. On the other hand, they are a fun and lively party band playing a diverse range of pop and rock covers. In addition to this, they can play in roving acoustic mode, with the singer using an old brass megaphone to sing through. Their extensive repertoire consists of over two hundred songs. Please use the links below to see the band performing at live at functions on You Tube. Please contact them for an extensive repertoire list and/or complementary sample C.D.